On Tuesday, May 9, three core members and three assistants of L’Arche Boston North will set out on an 8,000-mile, 26-day odyssey across America and back. They will visit twelve L’Arche communities from Syracuse and St. Louis to Seattle and Los Angeles. Along the way they will see Niagara Falls, Mt. Rushmore, Glacier National Park, the Pacific Coast Highway, and the Grand Canyon. 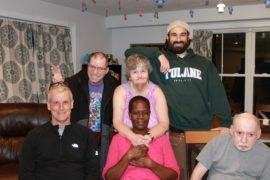 The plan for “L’Arche Across America” arose out of a conversation at Peace House on a November evening. Assistants Todd and Webster were talking with Woody, the community’s music historian, about Jim Morrison. The Doors, fronted by Morrison, are one of Woody’s three all-time favorite rock artists. (The others are Patti Smith and U2.) As everyone in L’Arche Boston North can attest, Woody knows rock. Woody told Todd and Webster that his number-one ambition is to walk on the California beach where Morrison composed “Light My Fire.” Todd said he thought that could happen. He recalled talk of a cross-country trip that had fizzled in the past couple of years and suggested the plan be resurrected. Webster volunteered his car, a seven-passenger mini-van. Todd added that he would pay for gas money. All agreed on staying in L’Arche communities wherever possible to save money. The final touch was to invite Jane, a longtime assistant, to round out the assistant team. Out of that simple conversation the idea was born! Adding Jane made for a striking cross-section of L’Arche assistantship. Todd (27) is a graduate of Groton and Holy Cross who hopes to enter medical school soon. Jane (51) is a native of Kenya and a former nun, who has been an assistant at L’Arche Boston North since 2005. Webster (65), a longtime resident of the Boston area, is a semi-retired book editor and publisher. Hoping to get quick approval from leadership, the assistants drafted a list of potential core members to make the trip along with Woody. The planned itinerary was a four-week round trip with stops at L’Arche communities along the way. Community leader Swanna Champlin suggested that the core members chosen should be three for whom such a trip exceeds “their wildest dreams.” Consequently,Doris, Woody’s wife of 26 years, and John D, who recently became a core member, were added to the travel team. All three—Woody, Doris, and John—have limited experience of life in other parts of the country. Once the trip is underway the assistants and core members will file reports from the road; so please continue to “follow” us and join the adventure! A “Welcome Home” picnic is planned for June 11 at the Anton Farm. We will keep you posted. The trip will be funded by our “Quality of Life” fund along with the generous contributions of assistants and anonymous donors. Like celebrations, traveling is an integral part of life in L’Arche. Our “Quality of Life Fund” allows for core members who have no additional funds or family support to enjoy the benefits of travel.